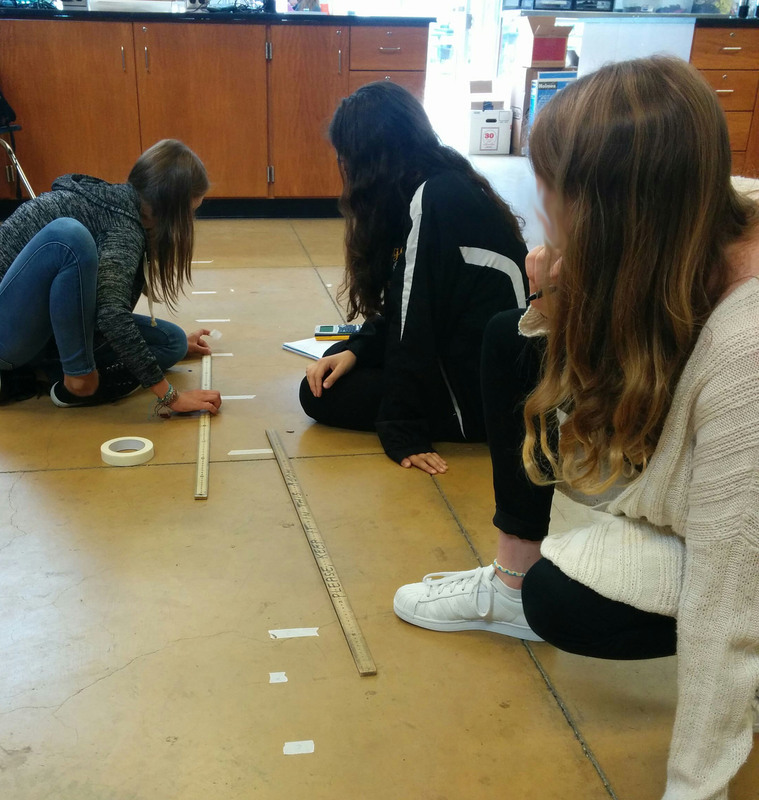 Some things I’ve liked about this – students are making measurements, moving around the room, sitting on the floor, and figuring out how to collect data on this own – it feels like controlled chaos (which I like). There’s also not too much guidance from me during the discussion – they can easily pick out the key parts of CV motion. there’s no obvious purpose to modeling the motion of this buggy. “Because physicists like to represent and predict motion.” Not very satisfying. To address concern #2, this year I tried starting the CV unit by asking students to predict the time and location of a buggy collision. (Many people use this activity later in the unit). 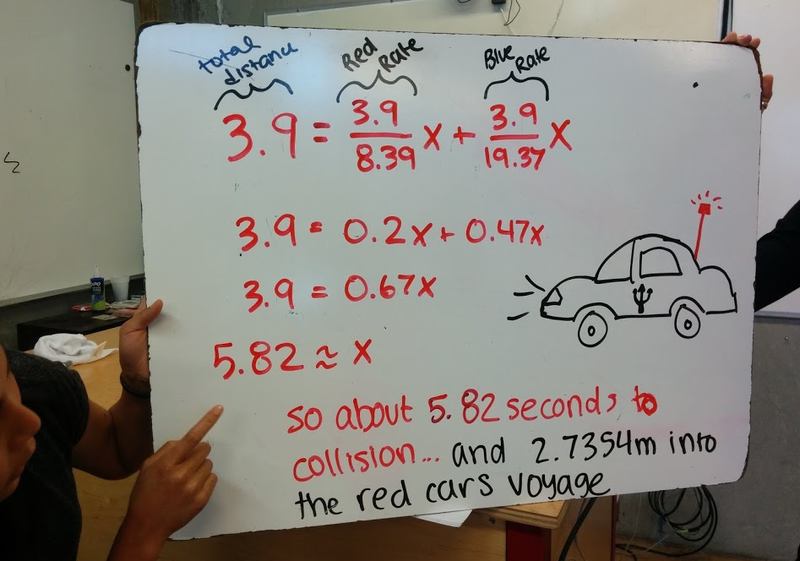 I told gave each group a fast and slow car and told them the initial separation and asked them to predict the time and location of the collision. 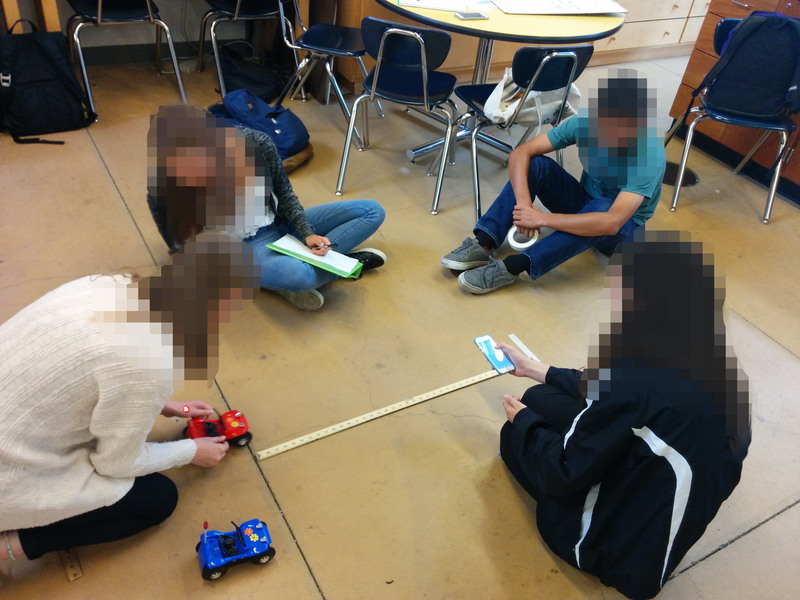 I didn’t give much other instruction other than saying they can take measurements of the cars separately but they can’t collide the buggies during their data collection. Some interesting things came up when students were making their predictions. Some wrote equations for the distance traveled, thinking about rates from math class. Some thought about the ratio of the speeds being equal to the ratio of the distance traveled. Some groups spontaneously thought about graphing the position vs. time without any instruction to do so. 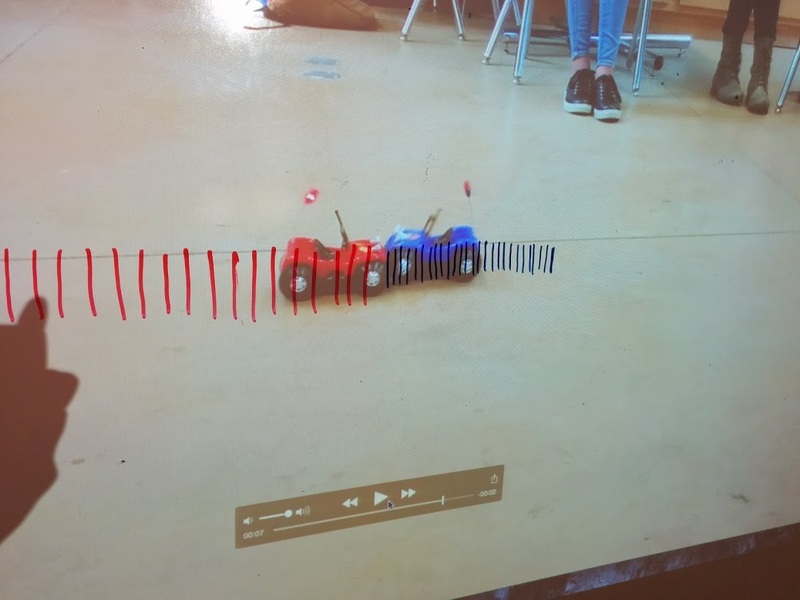 This group made found the speed of each buggy, and then used the speed to make marks on the floor to show where the buggy is each second, and saw where the collision would be. They got stuck, though, when they couldn’t figure out exactly when the collision would be between 7 and 8 seconds (when the marks crossed each other). One downside to doing it this way is that all groups assumed each buggy had a constant speed so they only made one speed measurement for each buggy before calculating the collision location (even those who were thinking about graphs). Some groups’ predictions were very close, and some weren’t, and we didn’t have enough evidence to know if the predictions were off because of bad data collection technique or because the car isn’t moving at a constant speed. But watching the cars, they so obviously look like they’re moving at a constant speed – so again, why is confirming that interesting at all? “Well, later we’ll get into more complex types of motion, but we’ll be able to use the same tools we’re developing here” Not very satisfying. Students loved watching the collision tests, though, so that’s something at least. When the buggies did actually hit, there was lots of cheering and clapping. This doesn’t address my first concern – that we have faster ways of making these measurements than crawling around on the floor with tape and a stopwatch. Although, I think there’s something nice about asking the students about how they could improve their measurements (after we watch the collision videos) and they say “use the video!” and I say “great, let’s do that!” We draw points on the board every frame. Then I ask how we could improve the analysis? “What if there was a program that could plot those points? 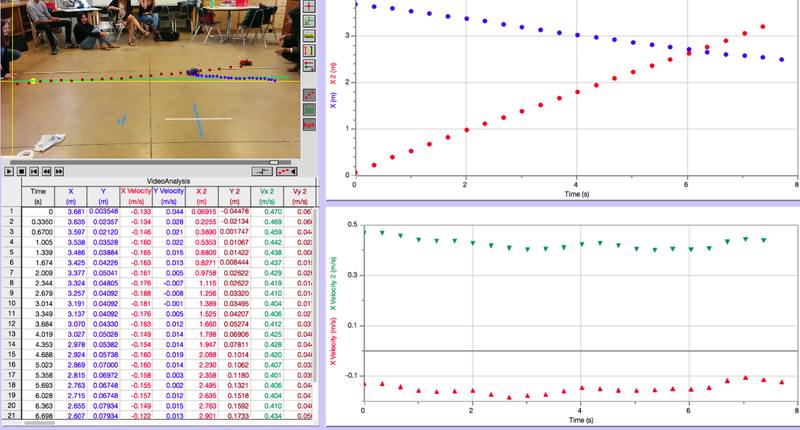 and I say “great, let’s do that!” We use Logger Pro to see the x-t and v-t graphs of motion and talk about what those mean. Then I say, well it’s still hard to make perfect dots on the video – human error and all – and what if we didn’t have a video? what if we wanted to make measurements in real time? They usually come up with sophisticated ideas for automated data collection, or just say something like “lasers!” and I say “great, let’s do that!” and introduce the motion detectors (not quite lasers, but close enough). So maybe starting by crawling around on the floor with tape and a stop watch isn’t such a bad beginning to this progression. Students get a physical experience to connect to motion detectors which might otherwise feel like magic. There’s also another issue with the way I did the collisions – they all started at the same distance away from each other and moved toward each other. Gets them thinking more about distance than position, as Frank Noschese explains nicely in this post from last year. If I do collisions again next year, I will definitely vary the direction and starting points. In general, I’m still not that excited about starting the year with kinematics at all, and I’m moving toward doing forces first sometime soon. Each year, I get closer to it – this year I did 4 days of Constant Velocity motion, finished with a quiz, and am jumping into balanced forces this week. I think it would be much more satisfying to start the year talking about “how” and “why” questions, and then get back to kinematics when it is useful to us. Have you tried forces first? Are you thinking about it? I would love to hear your experiences/ideas. I think the main reason to look at kinematics before dynamics is that most of the students won’t have the distinction between position, distance, displacement. Or speed and velocity. Or velocity vs. acceleration. The last of which is the biggest one. I know Kelly O does balanced forces before constant acceleration, and I don’t foresee a problem there. I think the order can be somewhat flexible, but make sure the storyline you create helps them overcome the misconceptions about velocity and acceleration before they get to the why. Otherwise, I think they won’t truly get the whole picture. I currently do 1. Constant Velocity, 2. Balanced Forces, 3. Constant Acceleration, 4. Unbalanced Forces and I like it pretty well. I’ve been shortening the CV unit each year to get to forces sooner, because to me it seems weird to NOT talk about the why from the very beginning. I’m not sure. I’ve switched to CV-> CA -> momentum -> forces and love it.